When Maj. Gen. Franklin Hagenbeck, commander of Task Force Mountain, who oversaw the operation, realized that battlefield conditions threatened to tip the initiative in the enemy’s favor, he ordered two SEAL teams inserted – one on a high ridge on the north side of the valley and another at Takur Ghar (High Mountain), a mountain on the valley’s southeast border, where they would set up observation posts, identify enemy positions and movement, and direct air strikes. The mission inserting the SEAL team at Takur Ghar resulted in the bloodiest action of the operation: the Battle of Roberts Ridge. The Shah-i-Kot (Place of the King) has historically been a guerrilla haven and bastion. A small valley with a base elevation of 7,500 feet and limited access, the mountain ridges that border it contain countless caves, crevasses, and other natural features that make it a defender’s dream and an attacker’s nightmare. Twice in the Soviet-Afghan War of the 1980s, the Red Army launched major offensives against the mujahedeen hiding there. Both times Soviet troops were driven out in defeat. Would American forces, equipped with the latest technology and advanced weapon systems, succeed where the Red Army had failed? So far, it had. The unprecedented use of U.S. special operations forces (SOF), assisted by special operations troops from other nations, U.S. Air Force and Navy air assets, and anti-Taliban Northern Alliance Afghan militia, had successfully overthrown the Taliban rulers of Afghanistan within weeks of the launch of OEF-A in October 2001. The focus had since shifted to the more difficult and demanding hunt-down of the surviving Taliban remnants and al Qaeda terrorists. In January 2002, intelligence reports indicated that the two groups were marshaling forces in the Shah-i-Kot. Attempts to gather hard information about the terrorists were hampered by the valley’s inaccessibility, rugged terrain, and the enemy’s skill in camouflaging its sites. This resulted in a paucity of facts that led to an intelligence estimate overly dependent on guesswork and recent past experience. The estimate determined that the valley contained 200 to 300 lightly armed, demoralized terrorists living among the 800 to 1,000 Afghan civilians in the valley’s four villages. The belief was that after a brief battle, the terrorists would cut and run, or surrender. The plan to eliminate the enemy in Shah-i-Kot was called Operation Anaconda, a deliberate reference to the constrictor that coils its body around its victim before crushing it. 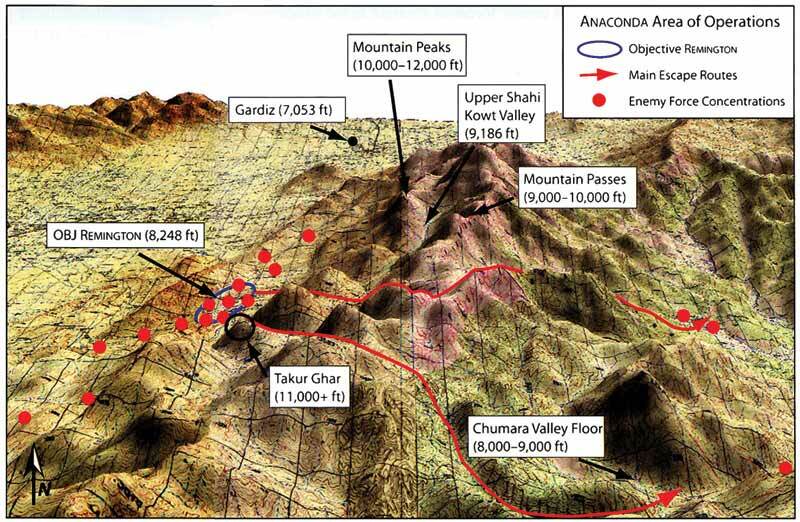 As originally drafted, Anaconda was to have several concentric outer rings composed of U.S. SOF, friendly Afghan militia, and special operations personnel – from Australia, England, and other nations – who would surround the valley. Once Shah-i-Kot had been isolated, the Afghan militia would advance into the valley as a “hammer” that would drive the Taliban and al Qaeda into the “anvil” composed of entrenched American forces. The plan anticipated the operation would take three days, with the heaviest fighting occurring on the first day. As it turned out, Anaconda lasted 17 days. The plan began falling apart when the inadequately trained and inexperienced local Afghan militia, demoralized by a friendly fire incident, inadequate bombing of al Qaeda positions, and stiffer-than-expected opposition, stopped fighting and returned to its base within hours after the battle had started. It was now up to the American troops to be both hammer and anvil against an enemy that they had discovered was stronger, better armed than predicted, and determined to fight it out. 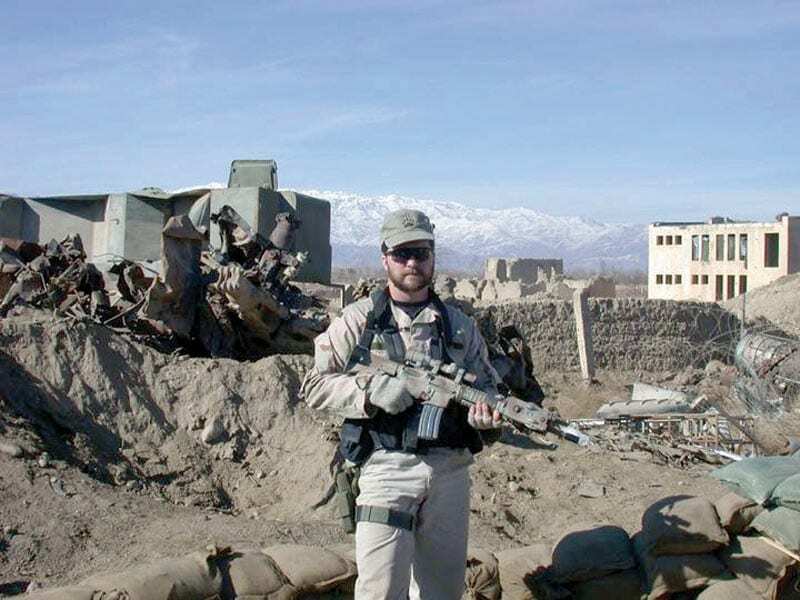 In the early morning hours of March 4, 2002, Chief Warrant Officer Al Mack, piloting Razor 03, an MH-47E Chinook of the 160th Special Operations Aviation Regiment (Airborne) – the Night Stalkers – lifted off from his forward base at Gardez. In the cabin behind him were members of Mako 30 – a team of six Navy SEALs – and Air Force Combat Controller Tech. Sgt. John Chapman. Razor 03 was late. Mack’s orders originally called for him to insert Mako 30 at the offset landing zone near Takur Ghar hours before, but maintenance problems with the original helicopter assigned to the mission and a B-52 bombing mission near Takur Ghar that interfered with the insertion had delayed him. As the on-scene commander, Mack, a 16-year veteran, had the authority to abort the mission and reschedule it for the following night. But the hard fighting in the valley had come as a nasty surprise and it was critical for the observation post to be up and running as quickly as possible. At 10,469 feet, Takur Ghar is the tallest mountain bordering the Shah-i-Kot. Its commanding view of the southern half of the valley made it a perfect location for an observation post. As Mack began his approach, he requested that the patrolling C-130 gunship sweep the summit prior to the insertion. A few minutes later, the gunship’s pilot was back on the radio saying that he had done so and that the site looked clear. Then the pilot said he had to leave and support “troops in contact.” Razor 03 would do the insertion with only its electric-powered mini-guns for defense.